Which Adventureaweek.com adventures would work well as a prelude to The Damned Souls of Fenleist? A6: Bear Trouble, A10: Icecrag Monastery, and B9: Curse of the Full Moon come to mind. The wilderness town of Feiknstafir could easily be located on the way to the party’s next destination and with how their entrance to the town plays out, I’d wager your PCs will be keen to get to the bottom of the mysteries there! What was your source of inspiration for this adventure? Castlevania. I loved the old NES series and even bought both the versions they made for the N64. I wanted to get the Eastern European feel of horror and surprise that game embodied and I think it hit the mark. Short of a guy with a whip, anyway—and Dracula, or any proper vampires for that matter. That was another one of my goals and it played out well with my playtest groups, who I’m fairly sure were ready to face down a blood sucking undead at the end of the adventure. How did the adventure change from your original concept? I started the build with Pathfinder (my preferred system) and when I went to do 3.5 conversions, I realized that half the monsters I used had no equivalents. 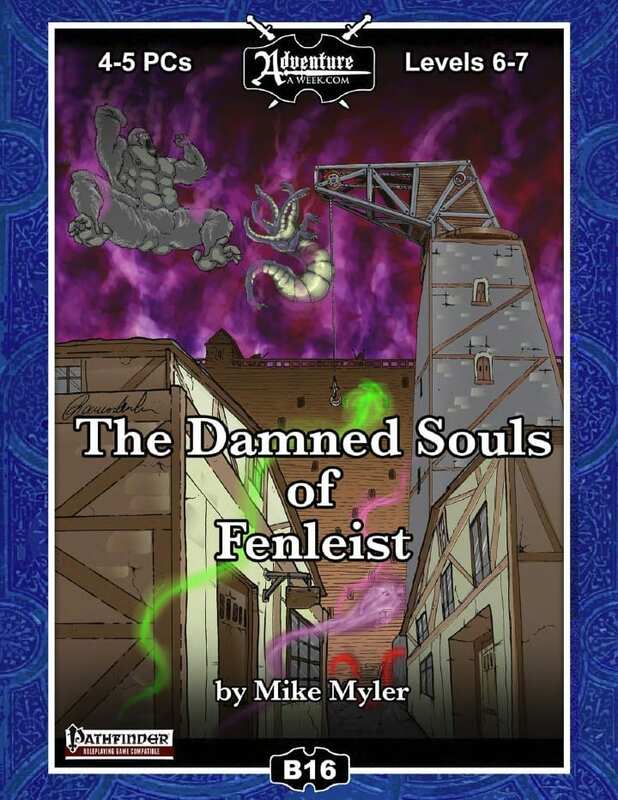 So there are actually two entirely different versions of the same basic adventure in The Damned Souls of Fenleist, descriptions and all! What is your typical process for fleshing out an adventure like this? I get an outline together and let it stew for a day or two, and then run it by my (slightly reluctant at this point but incredibly) supportive fiancee, who gives me feedback on whether or not it’s original and plausible and so forth. Then I sit down and write it. All of it. Using the basic format in the Adventure Composition Tutorial, write a synopsis for the module and then a background and hooks. After that, each bullet point in the outline gets expanded into paragraphs (or in some case, pages) and I don’t stop to do descriptions or intensive statistics; only short stat blocks and notes on important ideas for the read alouds. When all that is done, I try to get the publisher to take a look at it—I hate doing double work, so if some part of the adventure doesn’t work at this point, I don’t want to describe it (mechanically or otherwise). Then I get all my statistics out of the way. There are times when the rules conflict with what I intended, so those get amended before I finish up all of the descriptions. Once it’s gotten a playtest and been revised as required, the module is done! Did you do anything different this time around? Yes! I wrote one adventure set in Feiknstafir using 3.5 rules and creatures, then beside it there’s the same adventure set in Feiknstafir using Pathfinder rules and Pathfinder creatures! Flail snail or hydra? Possessed 2-headed shield guardian or terra cotta soldiers?! Oh, and the alternate dungeon, of course. After getting my hat handed to me in my first Endzeitgeist treatment elsewhere (The Clockwork Wonders of Brandlehill), I realized that making a huge crane like you see in a shipping yard but made of stone in the center of the town and just leaving it as a thing that’s there would not review well. So I wrote an entire mapless dungeon as an ALTERNATE ROUTE, a perilous journey through the thing’s underground workings that dumps them at the main dungeon at the end of the adventure. This book is just chock full of adventures! What tools did you use while writing this adventure? A yardstick and a few DVD cases. For the bridge fight, to get my players more immersed (it worked great), I had them move their miniatures across that, above the combat map until they got knocked off. Totally worth the brief setup. What is your favorite part of the adventure?
! I don’t even know how to answer that. If I HAD to choose, it’s the folding puzzle and the end of that puzzle. Doctor Strange and Silver Surfer are among my favorite comic books and what happens if the PCs successfully complete that part of the module is definitely in that totally bizarre cosmic theme. Tell us about one character, creature, item, or spell which was unique to this adventure. How did you come up with the idea and what went into the design of this part of the adventure? The charm of vital inference. It doesn’t actually play that huge of a role in this adventure, but overall it’s a really great item for GMs that like using undead but hate having them immediately identified as such. Also, it’s called the charm of vital inference and it makes people think that a creature is alive when it is not, and I think that is hilarious. Is there anything you would change looking back? Any suggestions you could give a DM/GM running this game which could help them through any rough patches? I would’ve connived a way to get more maps made! Seriously though, there are two spots that trip up PCs. First, there’s the bridge; if they don’t have any rope, or potions of featherfall or any of that and they skip past the rope of climbing at the entrance, they may fall a long, long way (and potentially die). Stress how foreboding the abyss beneath the bridge is! In the final sequence, make sure somebody is going in there with the ability to affect incorporeal undead if you’re playing 3.5 and for Pathfinder, that they’ve got some ways to heal themselves or make more out of spellcasting (in the latter, he’s got spell deflection); that’s what the Pixie/Witchwyrd merchant is there for! Which Adventureaweek.com adventures would work well after the players conclude this adventure?